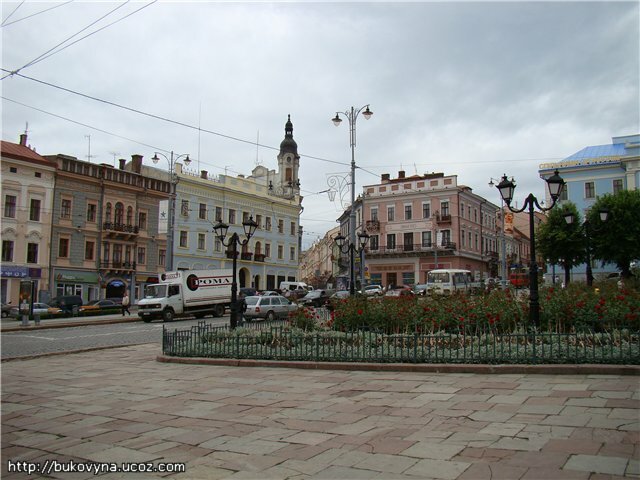 The core of Chernivtsi development during Austrian times was organized around Centralna ("Central”) square, formerly also known as Ringplatz or Marktplatz. The radial-beam principle of street location presuming square arrangement was accepted. 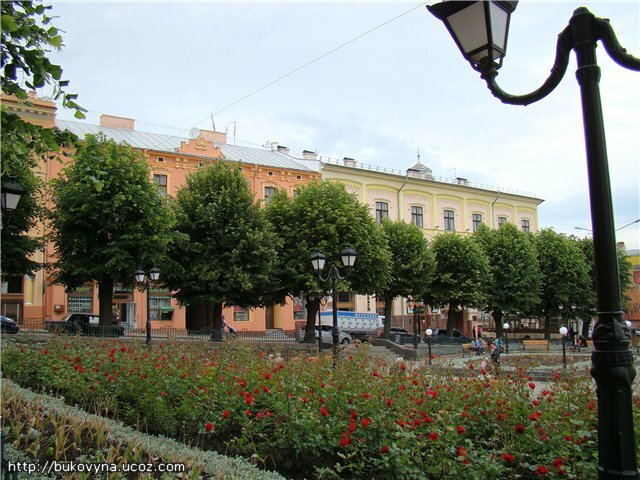 In the mid XIX century Centralna square was built up with one and two-storey houses. 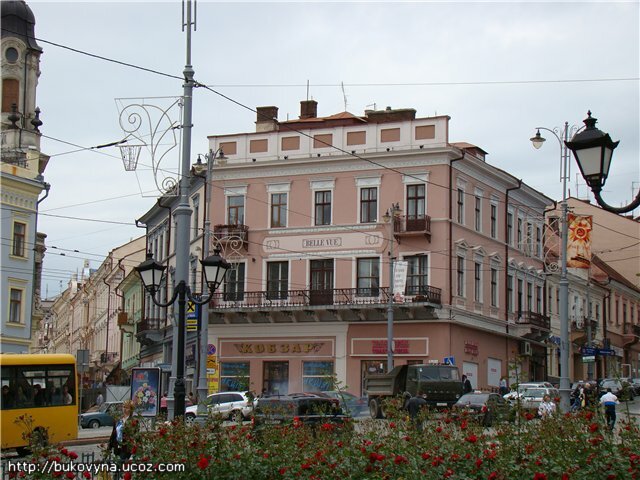 The building of the former Paris hotel still exists (which is now a store at the corner of Holovna and Ruska streets). 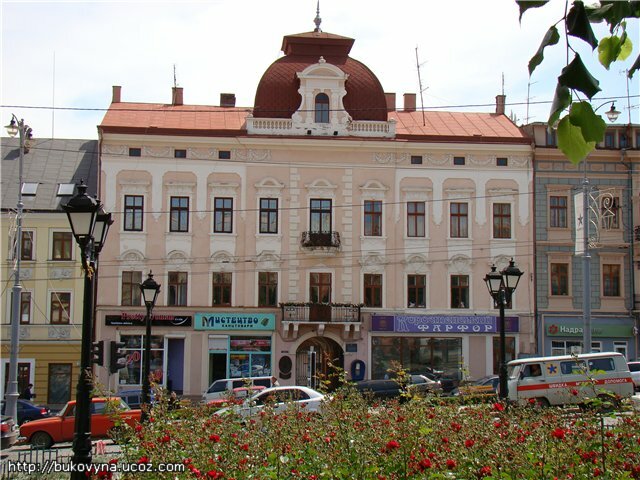 House No.7 where Chernivtsi Trade and Economics Institute is now located was built in the second half of the XIX century and is also known as former Under Black Eagle ("Unter dem Schwarzen Adler”) hotel. 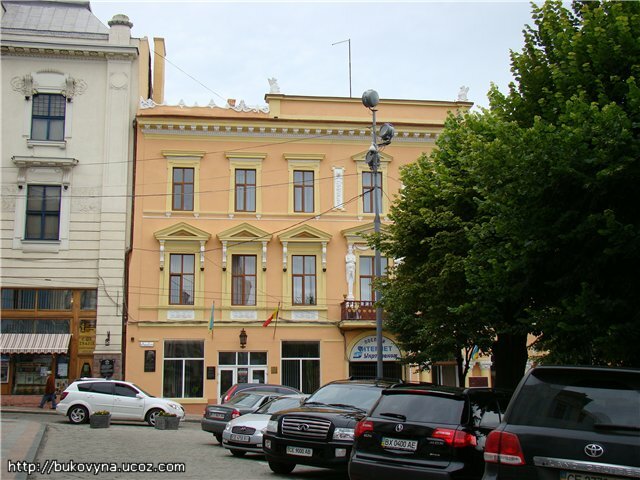 At the corner of I.Franko and M.Eminescu streets there was one-storey building of Russia hotel. 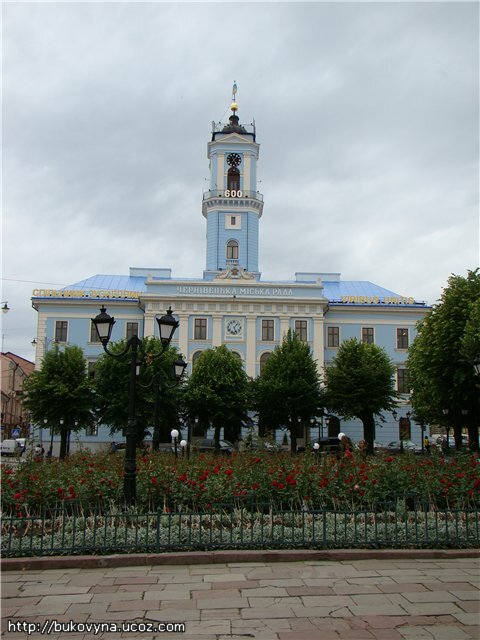 An important event in the history of the square (as well as of the hole city) development was the construction of the City Hall (1847) which became the administrative center dominating over the city. According to the ancient European tradition it was built in classic style with the use of Tuscan order on the main façade personifying and symbolizing the absolutism idea. The large horizontal body of the building is dominated by the high tower with the carillon symbolizing the monarch and the people subject to him. The municipal government used that clock to check the Vienna time (both figuratively and literary) which was lasting until 1862 when the city got the Magdeburg right thus initiating local self-government. 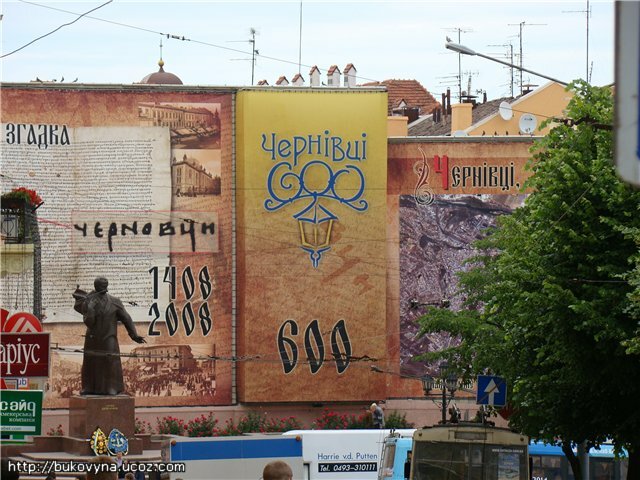 The City Hall neighbours on former Belle Vue (1865) and Three Crowns (1878) hotels followed by former "Habsburg” coffee-house (1898) (the latter two now allocate the Chernivtsi branch of the National Bank of Ukraine). 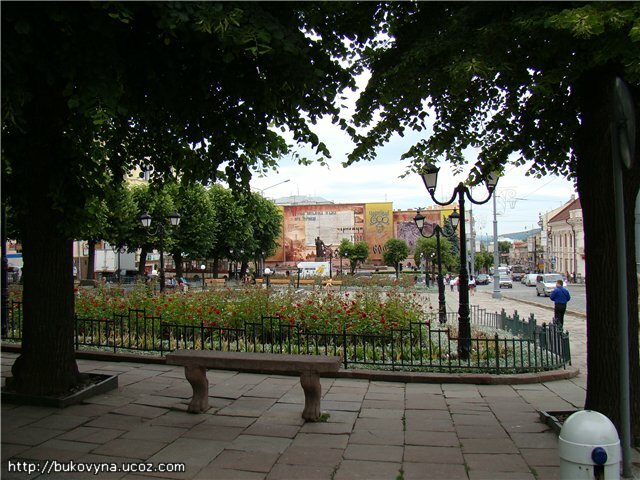 The formation of the square was finalized by the construction of Bukowiner Sparkasse administration building in 1901 at the place of Russia hotel, which started the Art Noveau era of Chernivtsi architecture. 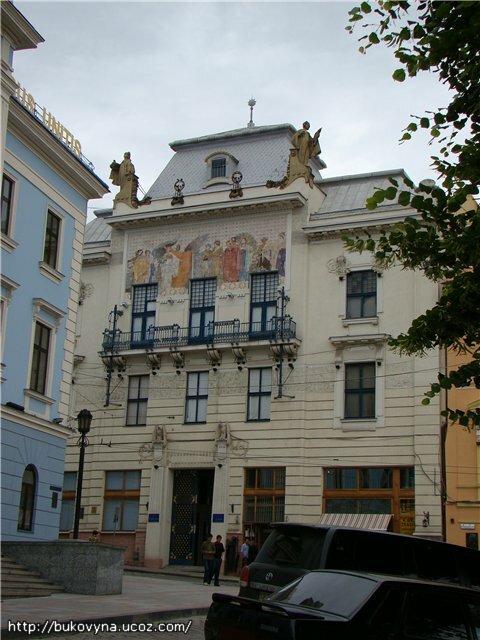 Today the building allocates the Oblast Museum of Arts. 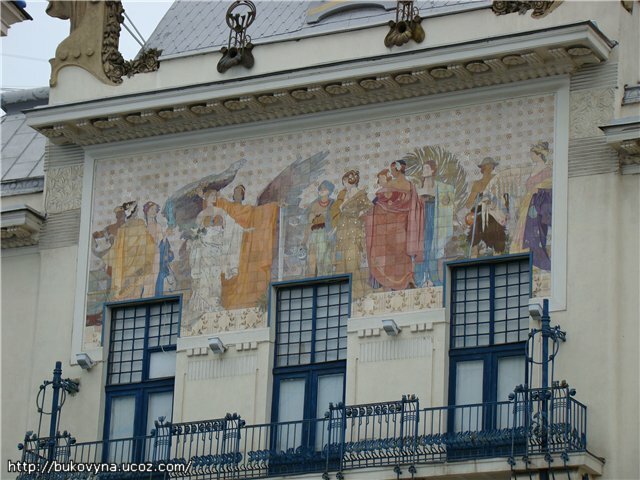 The façade and inner scenes of the building are a synthesis of arts where architectural forms are supplemented with sculptures, figurative majolica panel, fresco paintings, stained-glass windows and metalwork. The picturesque dome lamp of the staircase with allegories of economic prospering was made by Mykola Ivasyuk, a Bukovynian artist. 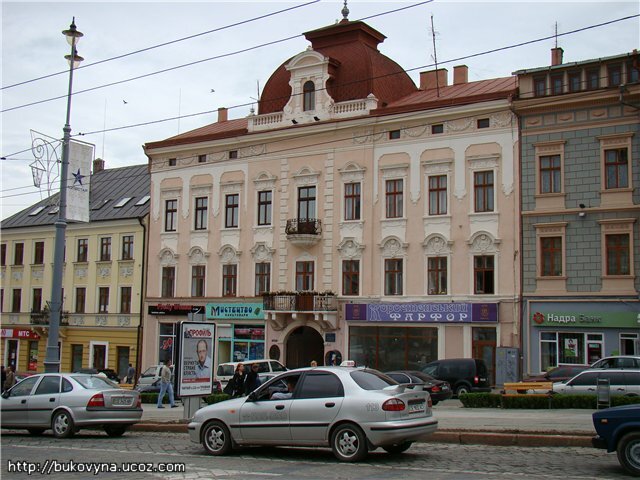 Belle Vue hotel and the beginning of Kobylyanska st.